SCENARIO: we’ve all just watched, mouths agape, as the near-impossible has happened. A new record for low seeds has been established, as 11th-seeded Kansas State has won the national championship! They’ve done it in stunning fashion too, eliminating a heavily favored 1-seed (Tennessee) in the national semifinal before blitzing Houston, 77-63, in the title game. So, we’ll be focusing on the Big XII first. It was a pretty unassuming season for K-State in the regular season. They amassed just one win over the Big XII’s top three finishers (Iowa State, Texas Tech, Kansas) and finished tied for fourth with an even 9-9 record. They did sweep Oklahoma, although losing to them in the 4-5 matchup in the conference tournament was enough to ensure that their place in the NCAAs was not totally guaranteed. Iowa State and Texas Tech shared the regular season crown, knocking Kansas from their perch. Eventually, three Big XII teams wound up with #2 seeds in the tournament, but ISU was not one of them – Oklahoma, despite having ten losses, is deemed worthy of the #8 overall spot in the tournament ahead of teams like Maryland, Nevada and a surprising Purdue. This is partly due to a blowout of Kansas in the conference tourney, as you’ll see. Next, almost as surprisingly, is the AAC, in which Houston has made a run to the tournament final. They don’t win the AAC’s regular season, with that achievement falling to a probably-just-as-good team in Cincinnati. The Bearcats won both regular-season matchups with Houston, and finished 15-3 to the Cougars’ 12-6, but Houston gets their revenge in the conference tournament final. With both teams having just six losses, they’re each highly regarded approaching the tournament. UCF is also a tournament team, earning a 10-seed. Tennessee is also a Final Four team, the only one from one of the top three seed lines. With that in mind it’s a bit disappointing that they don’t win it all, but this is still an incredible season for the Vols. 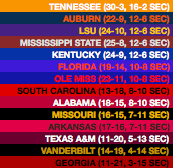 They win the SEC by 4 games, 16-2 ahead of a pack of 4 all tied at 12-6. Tennessee was ranked #1 in the country for most of February, having at one point run their conference record to 15-0, 26-1 overall. Late-season losses to Kentucky at home and at Auburn spoiled their chance for a perfect conference season, but they finish the year ranked #2 and a lock for a #1 seed. The last Final Four team is one you might expect, but maybe in a way you wouldn’t expect. It’s Michigan! 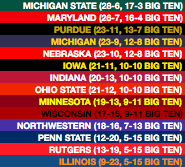 Despite sitting at 17-1, 6-1 in Big Ten conference play as I sit and write this, the season doesn’t end anywhere near what their fans would expect from this point. The Wolverines won their next three upcoming games to reach 9-1 in conference play at the halfway point, but won just three of their final ten, including a loss to Rutgers, to finish 12-8 and fourth in the Big Ten. Instead, the teams that run away from the pack are Michigan State and Maryland, and it’s the Spartans that win the conference by one game when Maryland surprisingly falls to Minnesota on the last day. Usually the ACC doesn’t have to wait this long to get profiled, since they usually have at least one team in the Final Four, if not more. They don’t this time, but it’s still a very successful season for one of the country’s three best conferences. 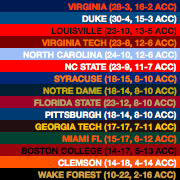 As you’d expect, Virginia and Duke continue to be monsters to deal with – despite last night’s result in Duke’s favor, the Cavaliers dominate the rest of the conference season, including a blowout of Duke at home, and only lose once more in the regular season (to Louisville). Duke and Virginia are both considered to be #1 seeds almost unanimously by season’s end, even after Virginia goes out early at the ACC tournament. It’s been a rough start to the Big East season for a previously promising Creighton team at 1-4, and that start blossoms into full-blown collapse in this sim. They finish dead last in the conference, while Marquette and Villanova both have excellent seasons and finish ranked in the top 15. It’s a pretty blah ending for the Pac-12 – while there are several people questioning whether there will be any at-large bids earned by Pac-12 teams, they haven’t actually fallen as far as that. Both Washington and Arizona make the tournament comfortably here, and Arizona State is left waiting on Selection Sunday to see if they make it, which they do as one of the First Four. Two more at large bids are out there, and while they’re both from conferences that people are eyeing as potential opportunities for at-large bids to be stolen, neither actually breaks that way. St. Mary’s wins the WCC tournament, although they might have gotten in anyway. That makes Gonzaga an at-large team, and a 22-9 Utah State team snags the final spot in the tournament after coming second in the Mountain West and beating Nevada once along the way. Thanks for reading along, all! See you back here tomorrow with a new power rankings post, with more bracketology to follow later in the week!